“Billy Elliot” is a fictional character, the “Dancer” is real. 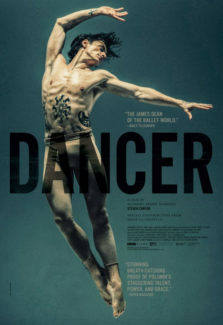 “Dancer” chronicles the life of the remarkable male ballet performer of whom the British media named “the bad boy of ballet,” Sergei Polunin. His mother recalls his son's fervent passion for dancing and how he had learned the gymnastics first before moving into ballet. "Polunin wanted to be the best," his loving grandmother remembers. To provide with the tuition funds Sergei needed to succeed in dance, his family separated and went to work in other countries (Greece, Portugal, and Russia). Polunin moved with his mom to Kiev. The emotional toll worsen when in London he his mother had to go due to a visa problem. At the age of 19, Polunin becomes the Royal Ballet’s youngest principal dancer in history. His family never saw him on stage. Sergei was so demanding of himself that the pain of his body had to be mitigated with cocaine. Polunin's virtuoso recognition started in Ukraine, then when he moved to the U.K., Russia, and now it continues in the U.S.A.
Sergei Polunin, in four minutes of breathtaking performance, inspired thousands of fans who could not stop playing the clip over and over. In days, the music video went viral with more than 17 million views worldwide. In “Dancer,” his sexuality was never disclosed, as the story centers on his struggle, his moves, skills, and family. “Dancer” took nine months to edit, yet was still not enough time to make the documentary flow with creativity and a tighter structure. The transitions were rough. The story is linear with flashbacks from different sources (video, cell phones, the internet, film, news and TV shows). These were not properly trimmed and timed to keep the movie even in color and mood. In the documentary, some beautiful dancing shots were seemingly cut out too soon and other moments about his family were way too long. The director of this touching documentary, Steven Cantor, was able to capture Sergei Polunin’s emotions, skills, and creativity with an open heart. Polunin’s awareness was to use his body with his dancing to give people joy. “Dancer” is an inspirational documentary about sacrifice and personal growth that deserves to be seen by a broader audience around the world.